It is already dusk in Nimbhara — a small, nondescript village deep in the heart of India — but early morning for me. I am on a phone call with a farmer named Ganesh Nanote who has lived here all his life. 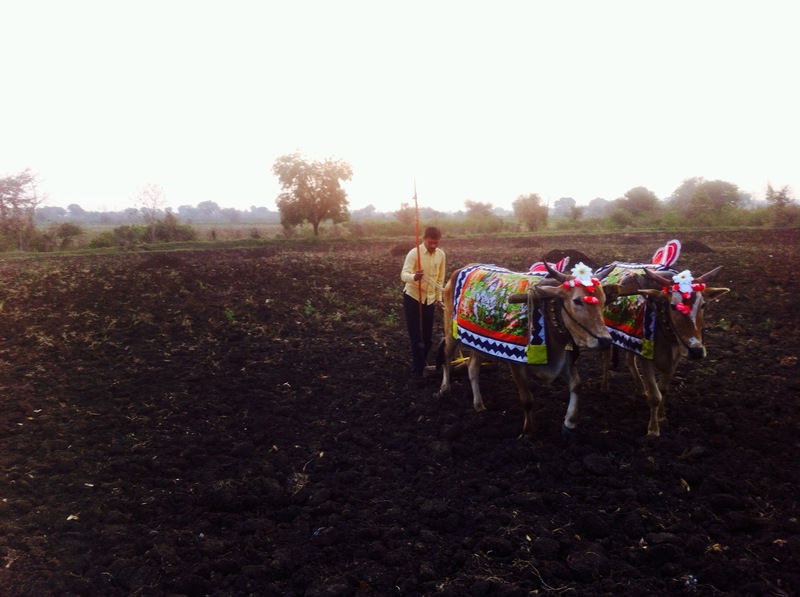 Almost all of Nimbhara’s 500 or so working adults find employment as cultivators. A single road connects Nimbhara to the highway system; it was only built about eight years ago, and is now plied by a regular traffic of bicycles and three-wheeler rickshaws. Nimbhara’s heritage, culture, and industry all spring from its soil — an alkaline black heavy soil, broken down from the Deccan lava flows that might have killed the dinosaurs 66 million years ago. 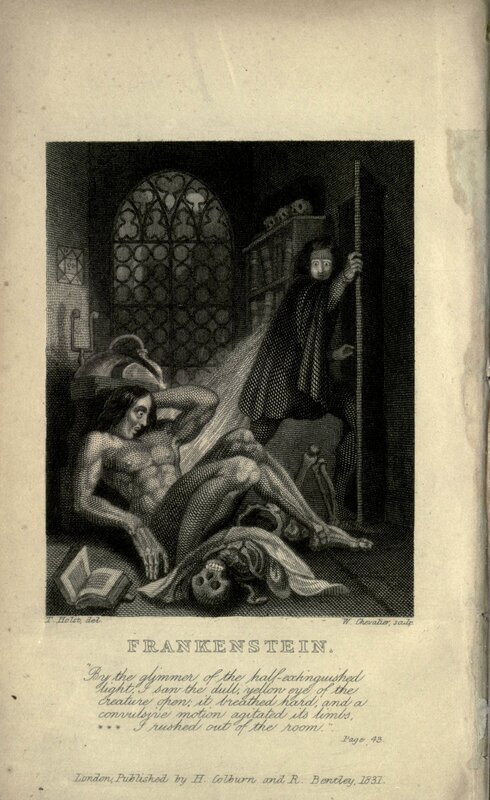 Mary Shelley’s 1818 novel Frankenstein tells the story of a student named Viktor Frankenstein who performs a scandalous experiment — so scandalous that he keeps the knowledge of it from his closest family and friends. Broken, repentant, and emaciated at the end of the story, he pours out the tale of his hubris to a stranger. He has discovered the secret of life, he confesses; obsessed with experiments in ‘natural philosophy’, he has been able to fashion a live human from body parts scrounged from graveyards and slaughterhouses. The resulting demon’s arms are like those of a mummy; his lips are black and dry; his eyes are yellow. Everyone that looks at him, including his creator, turns from him in utter revulsion. Not even given the dignity of a name, his creator refers to him as the fiend or the wretch. As a sutured set of body parts lying on a gurney he was merely grotesque, but when he moves, makes sounds, becomes animated — this is horrifying. He is not whole. No matter that he can speak or move or think, his origin is not natural. He is an unholy mishmash. I wrote two posts on Bt cotton but I have to admit it left me more confused than before. I went into it expecting to find that Bt cotton had kickstarted an epidemic of farmer suicides. But the closer I looked, the more the claims of Bt cotton devastation seemed to vanish into thin air. What I was left with though, was a list of problems of technology adoption — the kind of list that is very familiar in every industry that tries out something new. 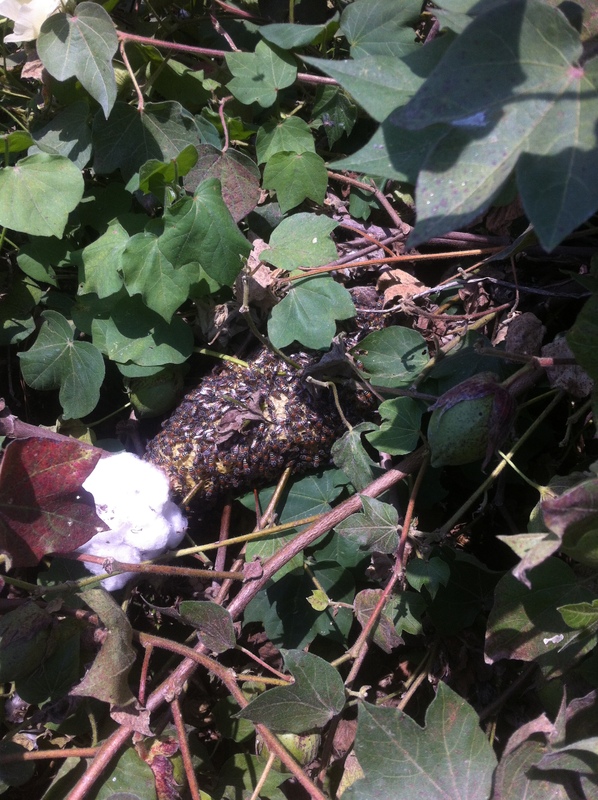 My mistake lay in hoping for an answer to a simple question — is Bt cotton good or bad? But this type of question might confuse matters more than illuminate them. A better question might be — what problems does it solve, what problems does it create? How does it interact with customs and practices in India? Look, Bt cotton is a technology. It isn’t the devil himself in the form of a seed, nor is it a benediction from the gods. It is a human-made technology. All of us who use computers know what that means. When they work, they are great. But most of us have had the occasional urge to punch a fist through the screen when it doesn’t do what we expect. Bt cotton was introduced in India in 2002 by Mahyco in collaboration with Monsanto. The prior three decades had been tough for cotton farmers in India due to yield losses from the bollworm. Farmers had to spend a huge amount in pesticides and many had given up on growing cotton entirely. Bt cotton comes with an insecticide in it (one that is safe for humans), that allows the cotton bolls to grow without being eaten by the bollworm. This makes it so that farmers don’t have to purchase extra insecticide and be exposed to those sprays. Plus, Bt cotton is a hybrid that seems to make bigger bolls. It does come with strings attached. It isn’t the wild form of cotton that humans discovered thousands of years ago that belonged to no one and to everyone. This one has been through years of research and tinkering in the lab. It is a corporate product. Therefore, the seeds are more expensive. In addition, you cannot save seeds from your harvest. You have to purchase a new set of seeds each year. As a matter of fact, the adoption rate of Bt cotton in India is 90%. Farmers are small business owners, and like any other such, they make a business calculation to see if Bt cotton is worth growing for them or not. 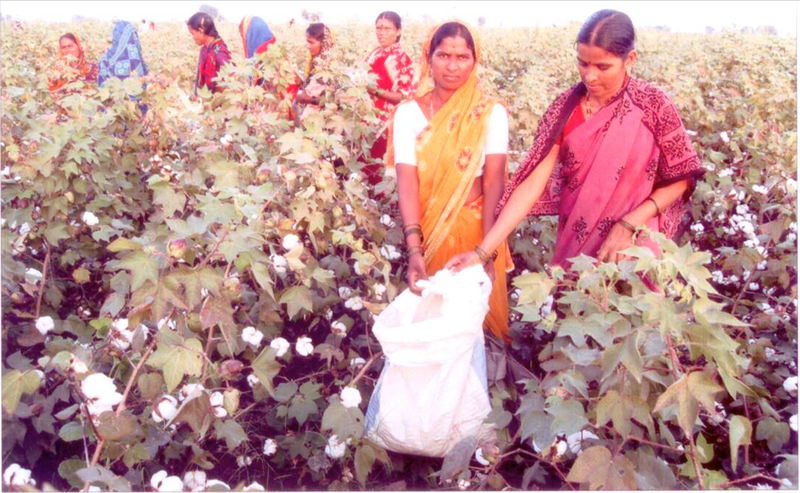 Sudhindra claims that Bt cotton lifted his family out of poverty. Much as us urban folks would like farmers to remain guardians of India’s halcyon past, they themselves have practical lives to lead in the present. What’s the problem, then? Clearly the story does not end there or there would be no debate. Where’s the strum und drang here? Why has the Mahyco-Monsanto alliance aroused fears that India is being stealthily colonized again? What about the epidemic of farmers killing themselves? Any media consumer who has not investigated this issue deeply themselves gets a constant drumbeat about Bt cotton having devastated Indian farmers. Words like catastrophe, epidemic, even holocaust are thrown around. But upon talking to farmers, Bt cotton appears as a solution to a three-decade-old problem. What gives? Here are some articles about the fears of farmer distress. Ostensibly the stories are about how Bt cotton is inadvisable to grow. But one has to read them a little smartly to see that the point being made is more nuanced than that: Bt cotton is inadvisable to grow when there is no irrigation. This makes sense — Bt cotton needs water. Being a cash crop, it can’t be eaten as a last resort if it can’t be sold. Plus, the farmers are being advised to be prudent and rotate their crops; plant non-Bt crops as buffers to avoid the bollworm becoming resistant; to grow lower-profit crops like sorghum as well for backup. None of it should be controversial. What is left unsaid are the reasons why farmers might not be following best practices. Some of those I alluded to in this article, where I mentioned the difficulty of disseminating information in regions of high illiteracy. The other reason is obvious when you look at Sudhindra’s chart above — cotton is a cash crop and has the potential to make a good profit, if things go right. Is there perhaps some excessive risk-taking going on? But what do I know — I can speculate plenty but I know little. So I talked to a farmer from Vidarbha, Maharashtra, a that region is said to have been devastated by crop failures, in order to get some inside information. Prakash Puppalwar farms in Yavatmal district in the Vidarbha region. It is known as ‘Cotton City’ because of its traditional ties to the growing and manufacture of cotton goods. He has an ancestral cotton farming background. He is one of a group of farmers that got an education in agriculture and came back to their village to farm so he has a good understanding of best practices, and also a handle on the problems that smaller, less educated farmers may face. I asked him a few questions on the phone and on email, what follows is a translated compilation of his answers. What problems do farmers face in Yavatmal? Some farms lack irrigation. We sow cotton in June and expect to harvest in October or November. In June it rains each week, without fail. July too. In August, sometimes there are 15 or 20 dry days at a stretch. During this time, we need some extra water. In addition, sometimes there is power-load-shedding at times when we need electricity for irrigation. We don’t get good weather reports at the time of sowing. Everyone knows that the yield of Bt cotton is high. So labor costs have gone up. Out of the cotton cultivation cost 65% goes towards labor. Plus, it is hard to find skilled labor. The government has fixed the MSP (minimum sale price) of cotton too low. In addition, some years back they had stopped the export of cotton entirely. Now it has restarted but not at the previous levels. They should have an import duty on cotton like they have on sugar. For a while the rate of cotton had gone up to seven thousand. Lately we had to sell it off at three thousand. We do not have crop insurance in case of crop failures. Farmers are eager to learn but they lack knowledge about farming with this new technology. They also lack knowledge about marketing. 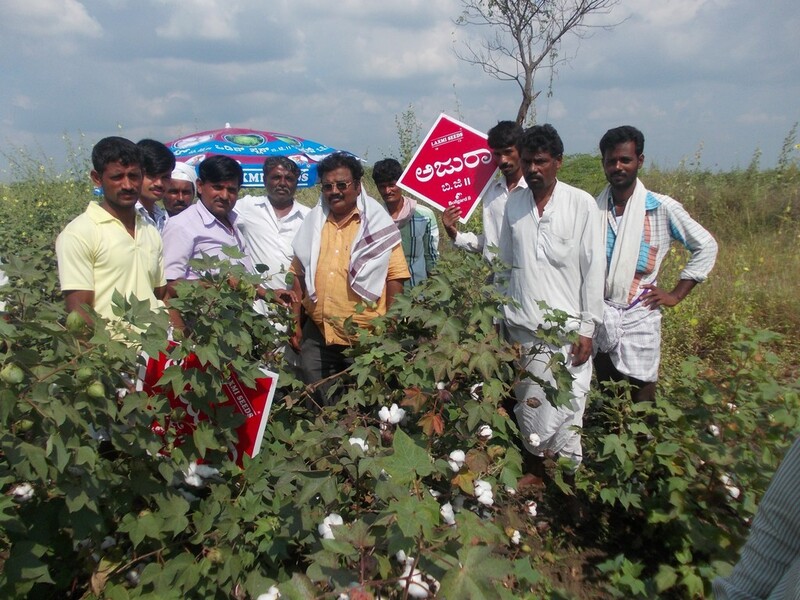 Do farms in your district follow best practices for growing Bt cotton? We do rotate crops. We use chemical and organic inputs in the ratio of 60-40. We are also told by the agriculture institute to have a buffer area of non-Bt cotton surrounding the farm and though we try, we cannot always accomplish this. You seem to have some practical problems. Why do people blame only Bt cotton? I don’t want to speculate on their reasons. But if we farmers are the patients, shouldn’t we be asked first what our disease is? Look, 100% of the farmers here grow Bt cotton. Why would we do that? With Bt cotton we have got freedom from an old enemy — the pests. We have surety. Even the lady farm workers know that with Bt cotton we have higher production. We have gone from four to ten quintals. I don’t understand why the whole blame should go on the seeds. The seeds are a small part of our cost. Out of our total cost of growing, 65% goes towards labor. Then there is fertilization, irrigation, marketing. The seeds are only 5% of our cost. Why would we blame the seeds? There are a lot of factors that go towards a crop succeeding or failing. You might have great production but if you can’t sell it at a good rate you would have a failed crop anyway. This year we have had only 33% rain that we expected so far. Smaller farms who don’t have irrigation could be wiped out. Those who have irrigation will be fine. That is a very important factor. But is it the case that conventional cotton is not as dependent on water as is Bt cotton? It is all about the boll. Conventional cotton did not grow bolls as big as Bt cotton. Plus the quality of the cotton was not as good. Since the bolls are bigger with Bt cotton, naturally it will need more nutrition, and in turn, more water. Specially in the boll-formation stage. This is not surprising. Have their been a lot of suicides by farmers in your region? Indians have always had a persistent phobia about being swallowed up by the west (clearly certain events in our history have had something to do with this). I don’t think anyone believes that we will literally be colonized again, but each new cultural encroachment by the west arouses fears of soft-colonization — the kind where we lose our cultural soul; where we become addicts who can’t do much but wait for the next cola-fizzed hit from western corporations. Gandhi promoted this notion as self-reliance or Swadeshi. I have more than a smidgen of this phobia myself. The sheer psychic disturbance I feel when I see a McDonalds franchise in a place where a vada-pav stall used to be is hard to put in words. I believe that GMO seeds arouse this fear in a visceral way because it is our very food production cycle that would now involve a reliance on products that are Videshi, not Swadeshi. I understand this fear and I feel it too. The blogger from Curry Leaf, one who I admire for her stories and her passion, expresses this fear in the comments on this post. As this is an emotional reaction, it isn’t wrong or right, and there is no arguing against it. But let me give you a little glimpse of my own inner dialog around this subject. I feel like the cultural influences we have already absorbed become invisible to us, and we fear the cultural influences that might occur in the future. Gandhi himself was educated in England and wrote books in impeccable English. We are debating this subject mostly in this foreign language as well, on the Internet created mostly by America. When one’s livelihood is involved, like for the farmers I have talked to, it becomes difficult to give primacy to an abstract principle above one’s own flight from poverty. It is often: Swadeshi for thee, but not for me. And, one has to remember that cultural influence goes both ways. If Indian cities are now heavily dependent on computers, cell phones, software and the rest, mostly from American companies, one has to think about the legions of Indian engineers they hire too. Where GMO seeds are concerned, the enterprise from the beginning was a collaboration of an Indian company with an American company, and, now there are Indian companies doing the research and production themselves. GMO is not the first interdependence we have with the west and it won’t be the last. Dear Reader, at this point I’m starting to think that Bt cotton is quite popular among Indian farmers. I got my first hint when I realized that there is a black market for Bt cotton seeds. If you think about it, there isn’t usually a black market for undesirable goods. The second hint came from the reading I did for this post, where I realized that Bt cotton improves yield for the farmers and reduces insecticide use, overall. That was this. A Bt cotton farmer from Karnataka state contacted me after seeing my post and wanted to tell me his story. I had a half-hour long conversation with him in Hindi (second language for both of us) and he gave me permission to put his story on The Odd Pantry. Not to put too fine a point on it, he LOVES GMO cotton. Sudhindra Kulkarni is a farmer in the Gulbarga district of Karnataka state. He sounds like a progressive and savvy farmer who has improved his lot far beyond the grinding poverty of his ancestors, all of whom were farmers. In 2012 his name was recommended by someone, he doesn’t know who, to join the Global Farmer Roundtable in Des Moines, Iowa. He was also sent to China as a progressive farmer by the Karnataka government. He had a lot of difficulties communicating because his English is not strong but it sounds like he did make a few good contacts there. He sent me this letter, that he calls his autobiography. I’m not sure why he wrote it, but it is also found on another website, exactly as the one he sent to me. OP: How long have you been farming? SK: This is our family trade. I have been farming since my childhood. In my father’s days we grew wheat, cotton, sorghum. We also kept bullocks [OP: Indian cattle]. He practiced traditional farming methods and faced a lot of poverty. I stayed in the farming line when I grew up. My brother is an entomologist in the Dharwad University. I supported him with my farming. He himself was hardworking and smart and got scholarships. I learnt about modern farming methods and was able to pay back debts. I also built a pakka house for my family [OP: Pakka house is a cement house as opposed to a hut]. OP: How much land do you farm and what do you grow? SK: I have 25 acres that I inherited from my forefathers and I lease about 25 more for Rs. 8000/= per acre per annum. I grow Bt cotton then rotate with pigeon pea and chickpea. I also grow sorghum for cattle feed [OP: I’ll take some too, please]. I have bullocks. OP: How did you learn about modern farming methods? SK: I learnt from my interest in improvement. The government has agriculture programs. I learnt from watching programs on TV. I leveled my land and got better yield. Now I use micronutrients for the soil and urea, potash and DAP. But I use organic methods too. In April we spread cowdung on the fields for manure. I used to practice purely organic methods but I had to give that up. In the old days we never tilled the soil, now we do. But we are still completely dependent on the monsoon. Four or five months of the year we get canal water. The rest of the time we depend on the rains. OP: How has your experience with Bt cotton been? SK: I have been growing Bt cotton for ten years. It gives me excellent yield. I get one-and-half to two tons per acre. 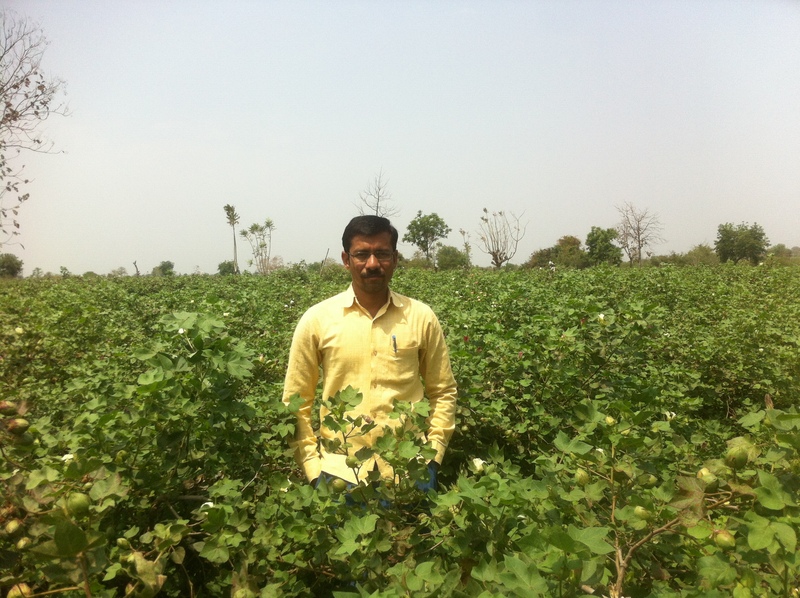 A farmer that I know is getting excellent yield with Bt cotton with purely organic methods. My cattle eat Bt cotton plants with no problems. OP: Who helped you write your letter in English? SK: My brother helps me with English. My 9th standard daughter helps me with Facebook and email. My language is Kannada. I don’t speak English well so it is difficult for me to get my message across. OP: What is your message for my readers? SK: My message is this. I have a sincere request. Please think about the economic condition of the farmer. Without good yield a farmer is nothing. Without good yield, a farmer cannot survive. My family would be destroyed. Without good yield, we are zero. Please do not listen to all the stories about farmer suicides. This is not just my story, it is the story of my whole village. [OP: He repeated this request five or six times throughout our conversation.] I don’t have good English so I cannot convince anyone. All this talk that the farmers will become slaves, this is all wrong. We need good yield. OP: What difficulties did you face while practicing organic methods? SK: # Ans: Animal Manure & cow dung not easily available ( Jeevaamruta )..varmi compost . pest control not possible..because environment not help # After that yield not getting..what we expected.. # Cost of production,overheads..all expense..after calculation..i didn’t get rate. # For me not possible to store my agri products till high rate,because i have also financial commitment .whatever rate i should sale. So there you have it. Before I talked to him on the phone, my husband and I wondered the usual things one has to: like, is he telling the truth? Has he been coached? Or bribed? Once I talked to him, I immediately felt ashamed for wondering those things. He is clearly an intelligent and committed farmer. To think that he must have been coached to have certain thoughts smacks of condescension. Even to think that he is coachable smacks of condescension. But in a sense, I am surprised at myself for being surprised at his story. The main beneficiaries of agricultural technology from the start have been farmers. This is true for GMO as well. American farmers have certainly voted with their feet to buy these seeds. Indian farmers are not that different, I guess. We are not Martians, after all. Obviously, he may love Bt cotton for the high yield it gives him and it could still have other problems. The bollworm could develop resistance to it. Or there could be ripple effects in the environment. Or perhaps there really are no other problems, or if there are, they are better than spraying general insecticides. All or any or none could be true. That would be a different post, however. Cotton is a light and breathable fabric but it sure does get itself into some very contentious debates. It has been a central player in colonialism in India, in the American Civil War, in the practice of slavery, and now, in the GMO wars. I remember my mother recounting some history from the British Raj days. Can you believe, she would tell me, we grow cotton in India, but we are not allowed to make cloth from it. They ship it to England, it comes back as cloth, and then we have to pay expensive rates to buy it from them. It’s our cotton! One could argue the opposite side as well. As egregious as it seems, England’s business model made sense. The cotton plants (India’s genetic asset) and their growing and picking (India’s manual labor) were only part of the story. Who would pay for the intellectual asset — the invention of the cotton gin, the spinning jenny, and other such picturesquely named devices that made much finer quality cloth, more tightly woven, and many times faster? These are not devices to be sneezed at. These inventions and others like it powered the Industrial Revolution. A similar debate now rages over genetically modified cotton. The quixotic Gandhi who stands in the way of Progress is Dr. Vandana Shiva. 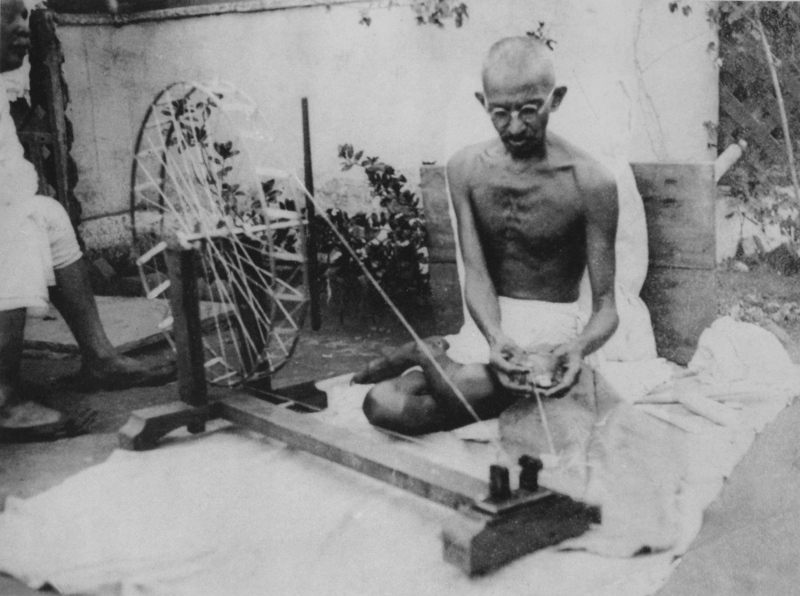 Gandhi spoke up for the imperfect, but diverse, home-weaving industry. Dr. Vandana Shiva speaks up for the unimproved, diverse strains of cotton that haven’t gotten any love from biotech companies like Monsanto. Is she right? Was Gandhi right? I don’t know, but I want to explore. Let’s talk about Bt Cotton. I wrote about Roundup Ready crops some time ago. Bt crops work in exactly the opposite way. Roundup Ready crops make it so that you can spray pesticide without concern for your crops — clearly, you can see how they might incentivize more spraying of pesticide. While Bt crops are not immune to pesticide, they come with pesticide in them. So you can see that theoretically they should not need any pesticide sprayed at all. The pest in this case, is the bollworm — the caterpillar of a certain moth. I don’t know about you, but when I hear a statement like ‘your food contains insecticide’ I start to smell the wonderful aroma of the Flit product from my childhood. There couldn’t be a better way to ruin my appetite for good. Now here we are talking about a plant growing with insecticide in its cells? Are you serious? It’s not as bad as that. Let me explain. I adore insects. But one has to admit, sometimes they work at cross-purposes to us — whether it is cockroaches in the kitchen cupboard, mosquitoes buzzing on a summer evening, or bedbugs making lurid bloodstains all over the sheets. Humans have spent a considerable time time trying to control them. But we are late entrants to the game. Plants have been indulging in their own battle with insect pests for half a billion years. Since they can’t get up and walk over to the store, they need to make their own. And they do. Plants fight pests silently (to us) but with astonishing vigor. No quarters given. You know those lovely daisies that little girls make daisy chains from and put them around their pretty little heads? They produce pyrethrum, a compound that attacks the insect’s nervous system. Jicama — that recent favorite of Californian foodies (of which I am one, I guess?) — the root that one cuts into sticks and puts in salad — the stems of jicama produce rotenone, a chemical that attacks the energy-production of cells. It is extremely toxic to insects and fish. The Neem tree is famously antisocial, by which I mean it is anti-fungal, antibacterial, anti-inflammatory. Neem’s special contribution is azadirachtin, a chemical that prevents insects from growing, and while they remain stunted, it makes them lose their appetite to the point of starvation. Diabolical. But they actually need to eat the plant tissue to get the poison, so insects that care only about the nectar and pollinate the plant are not affected. What one looks for in a ‘good’ insecticide is the following: it must not kill indiscriminately — in particular, it must not be toxic to mammals. It should only kill insects pests, not be poisonous to the pollinators, nor to the predators of the insect pests. It must not hang around in the soil for long, i.e. it must biodegrade, but while it is hanging around it must not slosh around and get everywhere. In these ways, a certain bacteria called Bacillus thuringiensis makes pretty much the ideal insecticide. This insecticide protein is called ‘Cry’ and that is probably what the insect does upon ingesting it. It works by perforating the insect gut walls full of holes. It can be very specific, as in, there are strains that will affect only beetles that chomp on some Bt, and others that will only affect moths. It is very, very safe for all other animals including us; this is because it cannot work in an acidic environment, which our bellies are, in general. Any Bt left over on leaves will simply degrade in the sun. Bt has been known as an insecticide since the 1900’s. But no one understood why it killed only moth larvae sometimes and only beetle larvae other times. No one understood its mechanism. Only in the 1980’s, when consumers were souring on wide-spectrum synthetic poisons like DDT, did industry start to take a look at developing biological insecticides into products. Chemical companies across Europe and the US divided up the Bt strains between them — some focused on killing mosquitoes and flies, some on moths, and some on beetles. Bt had been a sleeper in the insecticide world but its qualities made it a celebrity. Pretty soon scientists understood it down to the gene level, and at that point, given the advancements in gene modification, it was a matter of course to insert that gene into plants. I mentioned above that Bt spray, when applied to plants, degrades in the sun or simply washes off. While that is one of its beautiful qualities (that it easily biodegrades), it does mean that one has to keep reapplying it. Wouldn’t it be great if the plant cells actually contained Bt inside, so it wouldn’t just disappear in the sun or wash off? Hello, Bt crops. 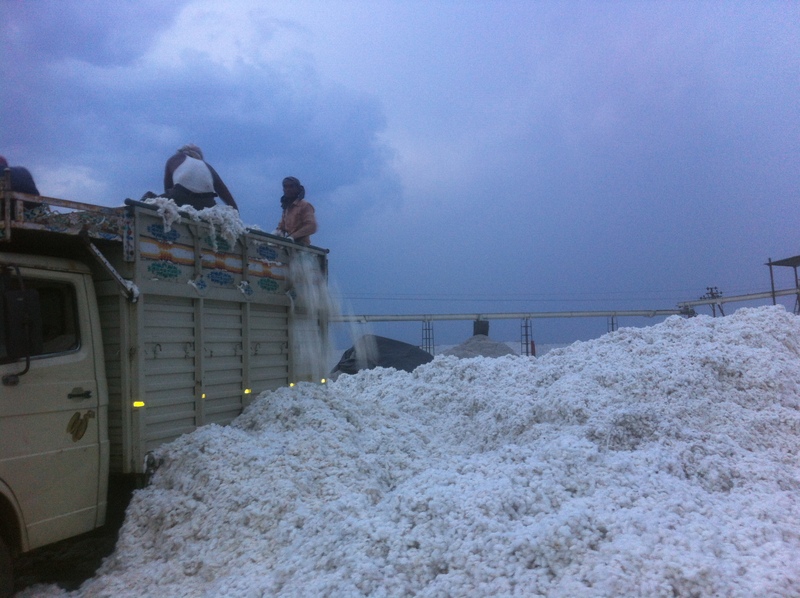 Bt Cotton in India — Seeds of Suicide? Cotton with an inserted gene that produces Cry came into the Indian market in 2002. 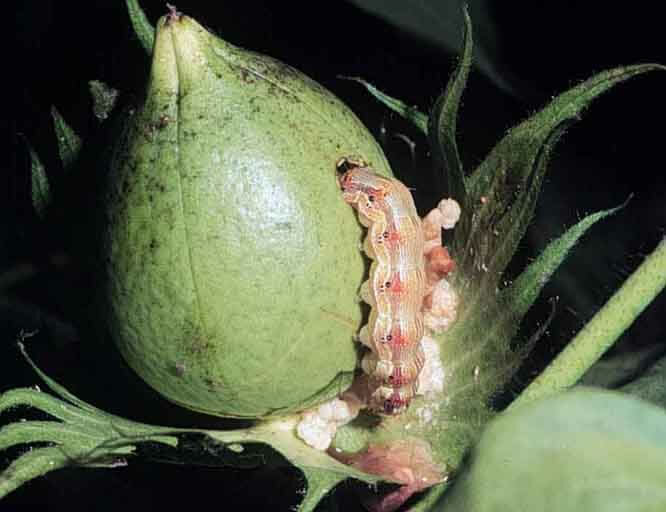 It protects cotton from its main predator, the bollworm. Before 2002, even though cotton was one of India’s main cash crops, the yield was one of the lowest in the world. Pests were a huge problem, and farmers spent more money on pesticide for cotton than for any other crop. Bt cotton came with the promise of not needing pesticide at all, because it would inherently fight back the bollworm. Before the government approved it, Bt cotton had already created a buzz and seeds from Monsanto had been smuggled in to sell in the black market. After it was approved, by 2010, more than 90% of cotton growers in India used Bt cotton. But while Bt cotton was being widely adopted, activists raised the alarm. Dr. Vandana Shiva in particular called it the seeds of suicide. Anyone (like your humble servant, The Odd Pantry) asking a simple question — ‘so, how is it working out?’ — is immediately assaulted by a battery-pack of confusing assertions. Yields have gone up! No! Farmer suicides have gone up! Spraying of insecticide has reduced! No! The bollworm has developed resistance to Bt and aphids have attacked cotton! What is true? What is not? I did a lot of reading the past week to get answers to some basic questions. I may not find the Truth but I can certainly throw my lasso around some facts. Q. Has Bt cotton improved yields overall? A. Yes. Overall, so far, from 2002 onward, yields have gone up a lot. 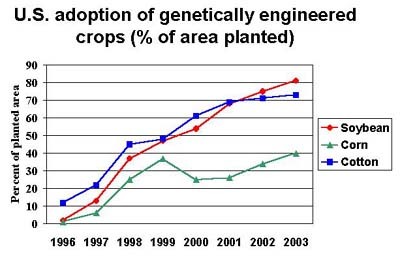 Not all of the increase is due to genetically modified seeds — other factors have mattered too. But, 19% of the yield increase is because of Bt cotton. Q. Has it cut down on the amount of insecticide that needs to be sprayed? A. Overall, yes, the use of Bt cotton reduced insecticide use by half in the ten years after it was introduced. This could change as the bollworm develops resistance to Bt or other insect pests start attacking cotton. But in the meantime, yes, insecticide use did go down. An added benefit here is that farmers have reported many fewer cases of pesticide poisoning. Q. Has the Bollworm developed resistance to Bt cotton? A. Yes, indeed, it has, in some places. It has been 10 years of Bt cotton use in India and considering that 95% of the cotton grown now has the Bt gene, the bollworm has a big fat bull’s eye to evolutionarily aim at — the target being resistance to Bt, and the enormous benefit being that it doesn’t die. In 2010, Monsanto admitted that they had found bollworms in Gujarat that were resistant to the first generation of Bt cotton crops. Q. Have other pests attacked Bt cotton? A. Nature seeks balance. If Bt cotton crops have become pretenaturally safe from bollworms, other insects will surely be emboldened to attack it. Have they? Yes. In recent years a new pest of cotton called the mirid bug, rejoicing in the absence of the bollworm, has been feasting on cotton (story from China). This did not happen directly because of Bt cotton, but because the farmers had massively cut down on spraying general insecticides on their crop. The rise of the mirid bug is eroding some of the benefits of Bt cotton by forcing them to run out and purchase insecticides anyway. Q. Did sheep die after grazing on Bt cotton? A. Starting in 2005 shepherds in Andhra Pradesh reported that sheep that grazed on the remains of Bt cotton for 3-4 days seemed to pick up a disease and die. Surprisingly, no one seems to have gotten to the bottom of this claim; was Bt cotton to blame or not? Activists claim that this is obviously GMO poisoning, but the case is not as clear-cut as that. There were cases of pneumonia mixed in with the sheep that seem to have been poisoned, which makes it hard to separate. And, some investigations found pesticide on the leaves, so it could have been that. The authorities on the other hand, claim that this is just hearsay, that the sheep simply could not have died from any Bt cotton toxicity, and the tests they have done prove it. But, there actually haven’t been any tests done on sheep (there have been tests on buffaloes, goats, chickens and cows). Also none of the tests involved fresh plant material, they just involved cotton seed meal. It is also possible that the toxin came from the non-Bt parts of Bt cotton. So far, it seems like the authorities in India have failed to get to the bottom of this. This article is very detailed but is a good account of the sheep deaths. Q. Have farmer suicides shot up due to Bt cotton? A. Now we come to the most incendiary claim — that the use of GM crops have led to growing numbers of farmers taking their own lives. There is no way to discuss this that isn’t going to sound callous. But let’s try. There are two ways to look at this — as statistics, or as anecdotes. This paper looks at the question statistically. They chose to use statistics from the crime bureau rather than the ones collected by the state governments, because the ones from the crime bureau are more accurate (and higher). What they found is that farmer suicides have not increased, overall, since the introduction of Bt cotton, although they found local variation. This paper on the other hand, looks at the question anecdotally, although it doesn’t choose to word it that way. I don’t say this to knock it. Anecdotal accounts may bring tragedies to light that get elided into a blip on a curve when you look at it as a statistic. It seems clear that some farmers did face GM crop failures; and for some of those it meant digging deeper into debt. People in wealthier countries where one can declare bankruptcy might wonder why unpayable debt is a reason to take one’s own life. In India, among the poor, this can be a disaster. They mostly do not have good, regulated microcredit available. I’ve known loan sharks to send hoodlums out to their delinquents for beatings; having their meager possessions auctioned off is a regular occurrence. If it was indebtedness, can it be blamed on GMO? Well, perhaps it wasn’t the Bt toxin itself. But the GMO seeds they obtained come with a context — a high price, marketing, regulations followed and not followed. I will explore that in the next section. Look, after my week of reading everything I could lay my cursor on, I think I am free to make a qualified claim: so far, overall, Bt cotton has helped Indian farmers. It has helped them, overall, get better yields and make more money. But, it has not been a uniform success. The Indian context in particular has had a bit of a culture clash with the more modern economy that Monsanto usually operates in. When Indian farmers have crop failures, this is often a life-destroying event. What kind of culture clash? The rural population in India has high rates of illiteracy. Many farm workers cannot read or write, let alone get on the internet to look up seed laws. In this environment, hearsay will always have more influence than the latest official dispatch. Instructions from Monsanto about planting buffer areas with non-Bt cotton were not well understood, or, the farmers didn’t have the luxury to ‘do things right’, leading to some places where the bollworm developed resistance to it. In Andhra Pradesh, some farmers didn’t understand that they did not need to spray insecticide anymore, therefore cutting into the profit they might have had. They are not jaded with years of marketing-speak and haven’t learnt to discount it. Farmers believed the most inflated talk about yields that they could expect from Bt cotton, and probably did not have the cynicism needed to know that this was advertisement. They might have taken more risk than they ought to have given the high cost of the seeds based on this marketing-speak. The concept of intellectual property is not well understood either — I know this first-hand, because when I was in India we pirated software with abandon, not really understanding that there was something wrong with this. When we bought grain in bulk, some of the small-time vendors adulterated it with stones. Piracy, the black market, adulteration, these are ubiquitous, specially for poorer farmers who are price-conscious and have no consumer representation. There are several cases of unauthorized Bt cotton being sold in the black market, which is usually adulterated with cheaper conventional cotton. Clearly this crop is not going to be as resistant to the bollworm as the pure variety. The practice of buying seed from a catalog for each new season, very familiar for American farmers, is a bit of a culture shock to Indian farmers. Monsanto’s seeds lose their vigor after single growing season; farmers who have become trained in the practice of growing GM crop have a high dependence on the private sector and are subject to their price whims. It also seems like Monsanto and their Indian collaborators have not always chosen the best varieties of cotton for the Indian situation. Some of the initial hybrids they chose were not drought-tolerant; this is fine for modern societies where irrigation is a given, but in India, most farmers are still heavily dependent on the monsoon. Some of the GM crop failures in Andhra Pradesh were because of this. Other times, the hybrids they chose grew fine but had a shorter staple length and did not bring in as much profit as the farmers had counted on. On the plus side, Bt cotton has the potential to drastically cut down the use of pesticides. Not only is this a health benefit for farm workers (they can’t afford safety equipment like masks while spraying, or really, even shoes, so some exposure is guaranteed), it is also good for the environment. Recently, natural predators of insect pests have had their numbers increase. Also, if cash crops are less prone to be eaten by pests, this is a benefit in and of itself. Let’s talk about the bad. With an engineer’s hat on, the problem of a pest on a cash crop has a simple solution: find a good insecticide and have the plant produce it. Done. With an ecological hat on, one wonders about the system one is tampering with. The simple solution starts to look like a silver bullet. In general the scientists believe that a GM crop like this comes with a natural life until the target pests develop resistance to it. I’m not smart enough to think through this very well, but here is a question. We know that Bacillus thuringiensis produces insecticide, but we don’t quite understand its role in the ecology. What happens when these creatures develop a resistance to it out in the wild — what does that do in the environment? What balance does it wreck? I don’t think anybody understands. But it doesn’t really matter anyway, because these ineffable concerns will never trump the immediate need for profit and predictability, and that might just be the story of industrial farming. 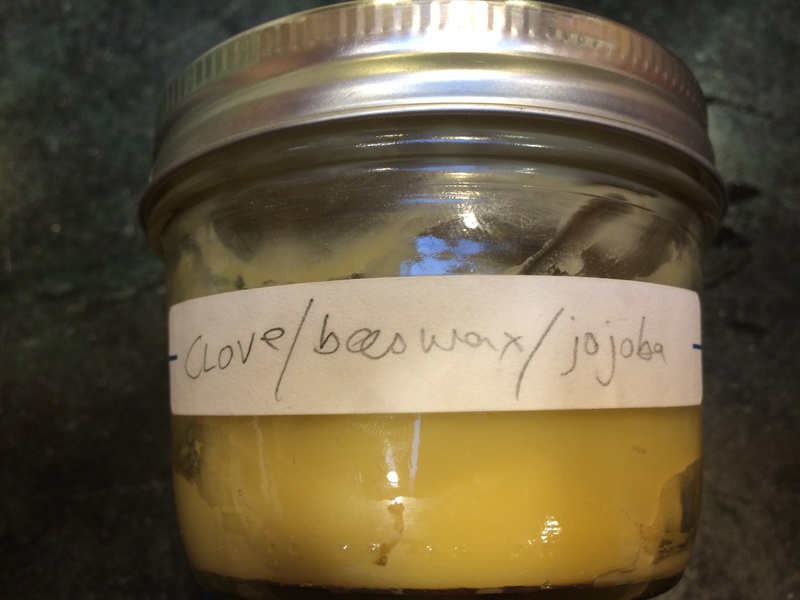 The other day my daughter and I did a fun kitchen project which had nothing to do with food — we made beeswax hand lotion at home. Never having done this before, I found myself a little befuddled. 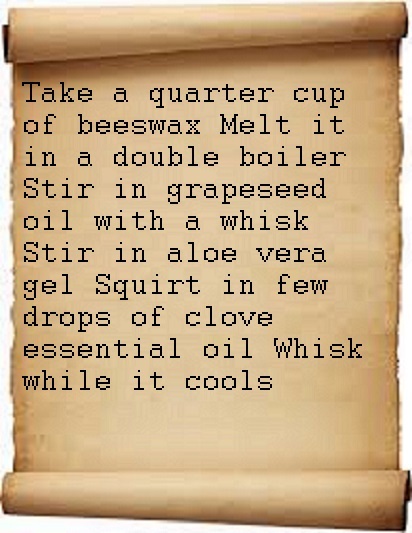 I had to stir in stuff while the beeswax was still melted. But how to keep it warm and not let it stiffen up while the whisking is going on? Luckily, my experience with a completely different recipe — chocolate frosting — helped me. I stole a step from that very different recipe. I set up a double boiler and kept the beeswax warm in that. It took a while but it worked. I hope that did not raise any eyebrows. How dare I steal a step from one recipe to another? Did my hand lotion start to smell chocolatey? Of course not, I didn’t add any chocolate to it. Is my hand lotion now forever tainted as being somehow impure? Or unnatural? No — I demand that my misbegotten hand lotion be given its proper place in the pantheon of hand lotions. I ask that my hand lotion be accorded the same respect as other hand lotions, which means, please judge it on its traits. Does it smell good? Does it make your hands feel soft? And so on. What does this have to do with genes? Everything. DNA is a recipe. It isn’t really a recipe for living beings — it is a recipe for proteins, which in turn are a recipe for us. Sometimes biologists stress that all life on earth is related. So every weed you see growing in a sidewalk crack, or every bacteria that you can’t even see — is your cousin. Mostly we know that because all of our DNA’s are written in the same language. I’m going to call this language Dnaelic, just to irritate my science readers and my Gaelic readers in one stroke. Where English has 26 letters, Dnaelic has just four: A, T, C and G. Words in Dnaelic are made up of 3 letters and are called codons. So CCC is a codon, TGT is a codon, and so on. Just like a sentence in English is a sequence of words that expresses a complete thought, a gene in Dnaelic is a sequence of codons that expresses a complete protein. Dnaelic even has punctuation marks like English to mark the start and end of genes. Imagine if the chocolate frosting recipe had been written in say, Choctaw, while the hand lotion steps were in English, I would find it pretty difficult to transfer steps from one to the other. Since they were both in English, it was easy. In fact, I will show you what I did. On the left is my original recipe. I’m going to call it the DNA for hand lotion. Now I am going to ‘cheat’ and drag in an instruction from the DNA for chocolate frosting. Can you spot the difference? My DNA for hand lotion now has an instruction spliced in. 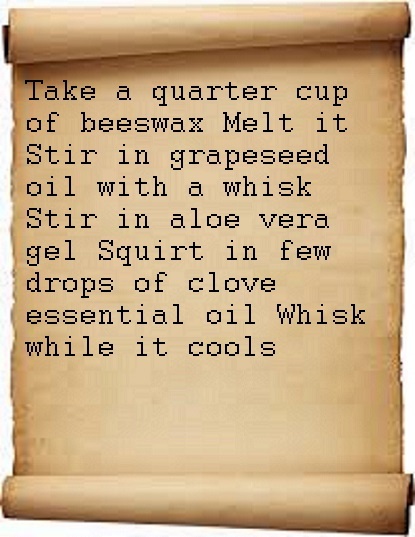 It will make better hand lotion, I promise. It will be softer (because the ingredients mixed in better) and will be way easier to grow. Sorry, I mean, way easier to make. And you will certainly be able to sell more of it. I’m going to call that dragged in step the trans-step. As you can see, it does not look any different than any other step. Theoretically, I could have just thought it up out of the blue (mutation) or, possibly, I might have got that inspiration to use a double-boiler by watching other hand-lotion makers at work (cross-breeding). Nevertheless, I got it from chocolate frosting, and to mark that special history, I will call it a trans-step. No doubt the example I gave above is a bit of a fable and much simplified. But as I read the commentary on GMO all over the Interwebs I find a weird dichotomy; the debate between the science folks proceeds at a very sophisticated level, while the debate between laypeople shows no understanding of the basics of genetics. Once in a while when there is cross-communication between the two communities, the debate devolves into accusations of idiocy and political hackery. The two communities cannot speak to each other! Our DNA’s may speak the same language but we certainly don’t. As laypeople, we need to understand the basics of this very important debate. We are all voters. So let me reframe some common GMO debates in the light of my hand lotion fable. Scientist: “I only keep saying that because I want to keep things simple. In reality what I mean is, ‘genetically engineered food’ is not a useful category. It is like saying all recipes that have borrowed steps from very different recipes are suspect. This is not a useful way to look at it. One has to study each genetically modified creature on its own to see if the introduced traits are good or bad (and, we have). In the hand lotion example, the borrowed step made a good hand lotion. But we could have as well borrowed a step that ruined it — say, a step that said ‘now throw it down the drain’. That would make a terrible hand lotion or actually, not make a hand lotion at all. Educated layperson: “I do actually think that genetically engineered food as a whole is something to worry about. I worry that you don’t understand the recipes of living beings well enough to be tweaking them. What if you put in a gene and it produces a protein as expected but it also has another unexpected effect? I also worry that your actual process is not very precise. What if instead of the clean splicing that you showed in the hand lotion above, the spliced gene actually goes in scrambled (left) or like this (right) where the transgene is ‘loose’ inside the DNA or somehow different? What if you are introducing proteins into a creature that has never had a protein quite like that before — does it matter? It is as if you put in a step in the hand lotion recipe to add something no hand lotion has ever seen before — like, say, I don’t know, Coca Cola. Would that cause allergies? Would it still be hand lotion? Scientist: “I find it amusing that you are typing this out on a keyboard and sending me this over the Internet. Did that not strike you as ironic? Everything natural isn’t good. The dinosaurs were wiped out by a perfectly natural asteroid that they would have loved to have meddled with. “You seem to have insufficient respect for how much humans have meddled with nature already, even before GMO. We have turned corn from this (left) to this (right) with just conventional breeding (and some help from nuclear technology). No, I’m not joking. If you walk down the aisle of any American grocery store, around four-fifths of the packaged food available for sale to you has some genetically engineered ingredients. And of those ingredients, most have been genetically engineered to be resistant to Roundup. So this particular trait is very pervasive, not only in our grocery aisles, but all over the American farmland: most of the corn, almost all of the soybean, most of the cotton is grown to be Roundup resistant. In a sense we are having the debate about whether to label GMO foods quite late; the barn door has been open for a while, the horse has not only exited the barn but is romping around the landscape making daisy chains. In this particular case, it isn’t the genetically modified seeds that are the issue, but the behavior that those seeds incentivize. The crops have been made invulnerable to Roundup, so that that particular weed-killer can get squirted around with pretty much wild abandon. What does that do? Glyphosate is a plant poison. It was developed by Monsanto in the 1970’s and, combined with other ingredients (some disclosed, some not) sold as a formulation called Roundup. As a herbicide, it was safer than the others that came before it. The earliest in the 1940’s was 2,4D which formed one half of the ingredients of the defoliant Agent Orange used in Vietnam. Then came Atrizine, which is known to be an endocrine disruptor, and is often found as a contaminant in drinking water. Glyphosate was a blessing when it was discovered. It works by blocking plants from creating certain kinds of amino acids. Since humans and other animals do not have the ability to synthesize these amino acids in the first place (we must get them from plants), glyphosate simply does not have the power to harm us. There was another reason why farmers must have rejoiced to have an herbicide like Roundup on their shelves; it is non-selective. A huge variety of plants, whether grasses, leafy plants, woody plants, or conifers, are affected by it. Stepping around on a lawn with Roundup-stained soles will in a few days turn those footsteps into brown patches. The scientists also found that it generally sticks to the top few inches of soil and doesn’t easily run off to pollute groundwater. Microbes are able to break it down while it is bound to soil. A miracle herbicide! Safer but is it safe? That is the theory. Reality is usually messier. For instance, given a big enough storm, the soil itself (with bound glyphosate) can run off into ground water, and there, microbes cannot break it down. Once in the water, a study showed that it induces changes in frogs by making them stressed as though there is a predator around, even when there isn’t. Plus, all the studies that talk about the safety of glyphosate miss the point, because the Roundup formulation contains a long list of other ‘inactive’ ingredients that Monsanto is not required to reveal, that are actually more toxic. 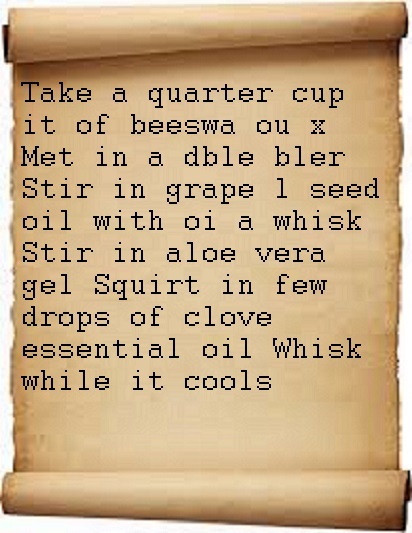 A preservative in it — Proxel — can cause dermatitis. Roundup also contains a surfactant called POEA — this chemical allows Roundup to be properly wet, so that the plant can absorb it all the way to its roots — that has been shown to be toxic to fish. It also was found to kill human cells in a test tube, its power magnified by working in concert with glyphosate. Glyphosate itself has been linked to non-Hodgkin’s lymphoma. Monsanto’s rejoinder to that study was basically that the association was weak, and that it proved correlation, not causation, ignoring the fact that while judging the toxicity of chemicals it is difficult to actually prove cause-and-effect without unethically exposing people to high levels of the stuff, just to see what happens. Plus, one has to remember that while animals don’t create these amino acids, microbes do. So glyphosate has the obvious potential to harm good bacteria in our guts the same way in which it kills plants. In fact, a study found that glyphosate is implicated in celiac disease due to its impact on gut bacteria. This factsheet from the Oregon state government is a good summary of harms from Roundup. Despite all this, weed killers have their uses. Environmentalists, forest-management folks, people with the best of intentions, have used Roundup to remove invasive plants and preserve biodiversity. (There is no reason to use it on your ornamental lawn, however. None.) These folks, and farmers, have gotten by with a judicious application of herbicide where needed. Judicious, judicious, judicious, one must emphasize in the manner of realtors. However, when Roundup Ready crops came on the market, judicious application of Roundup began to sound a little quaint. Conventional crops are just as vulnerable to Roundup as any weeds might be. So farmers could not use it with impunity. They couldn’t use a ton of it or spray indiscriminately; for another thing, they couldn’t use it while their crops were growing, it had to be done before they have germinated. Since they didn’t have a magic bullet, they had to use a mix of weed management methods: a mix of herbicides, a mix of crops, and other ways of controlling weeds. In the meantime, Monsanto’s patent on Roundup expired in 2000, which must have caused quite a bit of fretting among Monsanto’s business centers. They came up with a very ingenious new product that they could patent. They were able to create seeds of soybean, corn, cotton, etc., that weren’t affected by Roundup the way most plants are. How was this done? It turns out that bacteria need to produce amino acids as well. But the enzyme they use for this purpose is different than the ones most plants use. Different enough that it doesn’t get affected by glyphosate, but similar enough that it can produce the needed amino acids. Scientists were able to take a gene from these bacteria that produces this slightly different enzyme to put into seeds to turn them into glyphosate tolerant crops. It made the farmer’s life a lot easier, because they could spray Roundup all over without concern for the crops. It was Roundup and only Roundup, and a couple sprays all over did the job. Some called it agricultural heroin for farmers. For Monsanto, this meant more sales of Roundup and a near-monopoly on sales of seeds. For farmers, it meant convenience and certainty, at first. But, notice, they are subject to this rather pincer-like business practice of Monsanto — you have to buys seeds from the same company that sells you the spray, and neither can work without the other. For consumers, it means that we are consuming a lot more herbicide. All samples of GMO soy were found to have residues of Roundup in a study published by Food Chemistry. What does it mean for the environment? To examine this, we must forget about the marginal toxicities of Roundup that are the subject of endless debates and look squarely at what Roundup is advertised to do. In the insect world the monarch butterfly is a bit of a prima donna. It is not only the showy good looks, but also how exacting it is in its needs. Eggs must be laid on a milkweed plant, because the emerging caterpillar will eat nothing else. Without it, the caterpillar will simply perish. Every year, monarchs migrate down from Canada to Mexico flying over the Midwest where they seek out milkweed. In recent years this population has dwindled down by 81%. The monarch is such a star that people noticed. Not only does it drive tourist business in Mexico, but is also the state insect for several American states. Scientists have now found the cause to be the rampant spraying of glyphosate across farmlands in the Midwest. Milkweed happens to grow in those ignored areas that us humans don’t have much respect for — on the edges of farms, along highway shoulders. An edge of farmland that looks scrubby and pointless does not get the same respect as say a forest would. Since the advent of Roundup Ready crops, milkweed has declined by 58% with predictable devastation of the monarch population. I want to emphasize that people only noticed the decline in the monarch population because of its glamour. There very well could be many other species that have been affected because of glyphosate use doing exactly what it is advertised to do — kill weeds. When I’m pulling weeds in my garden I often find that some weeds have deviously designed themselves to escape me. One such is the dandelion. Its leaves lie flat to the ground and spread out, which makes it hard to get a grip under the plant and pull it. If you manage to, you realize that it is anchored to the ground by a thick ropy taproot with a grip of death. Then as I tug on the root, it breaks off easily, leaving a part of it still underground ready to spring up into a new rosette when I’m gone. Weeds are called that because they are escape artists. They have developed traits that let them survive whatever weed management you might use on them. If it is a lawn that is often mowed, they might lie flat against the mower (again, like the dandelion). If you mostly get rid of them by pulling, they might give you a false sense of security by breaking off easily but leave underground bulbs behind (like Oxalis, Bermuda buttercup). This is why we are forced to use several tricks to adapt to their adaptations; some by pulling, some by letting loose caterpillars that might feed on them exclusively; some by solarization. With Roundup, it seems, farmers were not this nimble. With active encouragement from Monsanto they came to depend entirely on spraying of glyphosate since the Roundup Ready crops came on the market. While glyphosate use grew a lot in the years since 1997, the use of other herbicides fell. Well, that was nothing but an invitation to weeds to independently develop their own resistance to glyphosate. Those farms were basically sitting ducks. Two such weeds — pigweed and waterhemp — have become huge problems in the cotton and soy farms of the Midwest. Because of these and others, farmers were forced to use even more glyphosate, based on advice from Monsanto’s scientists, as says this statement from farmer Troy Roush. Monsanto’s business practices are culpable here. In their 1993 petition to the US government to deregulate the use of Roundup Ready soybean, they insisted that weeds developing resistance to it was “highly unlikely” (the 1993 petition, page 56), mostly because no weeds had become glyphosate-resistant until then. They assumed that there was something about glyphosate that made it hard for weeds to develop resistance; also since glyphosate does not hang around in the soil, they would not have the time. Were their scientists trying to delude the government, or were they deluded themselves? This ought to be a lesson to both sides — those that insist that GMO is contrary to nature, and those that insisted (above) that nature could never pull off what Monstanto’s smart scientists had taken ten years of intensive research to do. The trait in question — resistance to glyphosate’s ability to block creation of amino acids. Interestingly, the first discovery of nature’s glyphosate-resistant weeds did not happen in a corn or soy farm, but in the backyard of Monsanto’s chemical factory along the Mississippi river. There, in ditches where glyphosate residue was often discarded, plants had been fighting this particular enemy for a while. By the 1980’s some weeds had already developed resistance to glyphosate in Monsanto’s own backyard and were growing happily in the sludge. When the scientists bothered to look, they found examples of Roundup Ready genes made by nature in their own ditches that did the job far more effectively than the gene they had spent ten years developing. Yes, nature was easily able to pull off creating resistance to glyphosate. It just needed a reason.